This is my introduction to braising! When we learn the technique of braising our meat, we will end up with a very tender beef that will almost melt in your mouth. 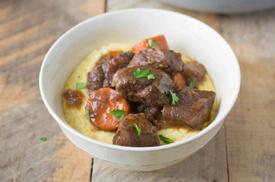 This version of beef stew is slow cooked and very simple to create. It is healthy and hearty and is packed with multiple flavors you will enjoy. We will serve it over soft polenta carrots and parsnip. This is a dish you will want to share with your friends and family!